“He stands in the mall, an oddly striking figure. Held between fine fingers that protrude from fingerless grey woollen gloves is a silver harmonica. 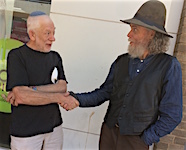 The man is playing.” HOWARD GOLDENBERG stops to listen, then has a conversation with this familiar figure around Alice Springs.